I am no longer updating Life in Chicago. Thanks to those who read my postings and offered comments. I hope to continue these stories at another Web site in the near future. On a cold, rainy night, a placid calm can be found 36 stories above the ground. There, in a carpeted room at the top of a Lake Shore Dr. highrise in the Kenwood neighborhood, far above a sea of lights expanding southwards, eight men and women dressed in white robes sit on their knees, waiting for Jamie Sensei to take the floor. Jamie turns to face an alter set up by the window. It’s made up of a photograph of an old, Japanese man with a beard named Morihei Ueshiba; a framed sign with a couple of Japanese characters; flowers; and two long, wooden rods. Jamie kneels to the ground and bows to it. The men and women in white robes follow her lead. She then turns around and bows to them, and they to her. Over the next hour or so, Jamie leads the group in stretches and mock fighting moves. The participants swivel their hips; they hold one another in pairs, stretching towards and away from their partners; they practice light punching and slowly falling to the mat. All the while, about a dozen spectators sit on chairs around the perimeter of the mat, watching. When it’s all said and done, Jamie Sensei bows once again to the group, and they again to her. Then everyone heads over to the room next door to watch a couple of videos. The first opens with the sound of a bell, while white letters on a black background read, “Spiritually, there are no strangers and no borders. Morihei Ueshiba, Founder of Aikido.” In the next scene, people in white robes grab, pull, and twist one another in slow motion. After some more footage of people in white robes dragging partners down to a blue mat, a string of snippets shows men and women clinking glasses around big, white tables, or doing a comedy routine on a stage with a microphone, or singing while snaking together in a long dance line around a ballroom. As the music continues on, up pops photo after photo of people. Jewish and Muslim, young and old; on a mat or off, women with hair covered or uncovered. Most of them are smiling. Captions at the bottom of the screen indicate the places: Cyprus, Israel, the Palestinian territories, Jordan. In one of the final images, a split screen shows two pictures. On the left, a woman stands on a mat, holding her right arm out in front of her and her left arm back, bent at the elbow. On the right, a tall, thin man with a graying beard and black skullcap stands with his hands clasped in front of him, his eyes looking down. Both wear a white robe. Jamie Zimron grew up in Milwaukee in the 1960’s. At the age of 17, she had had enough of high school and took off for the one place that her parents considered acceptable for their Jewish daughter to go to: Israel. There, she lived on a kibbutz— a communal settlement where residents share chores— learning Hebrew for four hours a day and farming for four hours a day, six days a week. She fell in love with the country. The incident motivated her to start reading about the history of the area from a Palestinian perspective. She knew about the Jewish ideal of returning to the Chosen People’s homeland. But for the first time, she was learning about how that affected Muslim residents there. The experience gave birth to a wish to foster peace between Israelis and Palestinians. In 1987, Jamie Sensei— sensei is Japanese for, among other things, teacher— began to introduce aikido to the then-Soviet Union, in the hopes of strengthening Soviet-American relations. By the time the 90’s came around, and she had her epiphany of purpose, she found it only logical to try use the martial art to counter stereotypes and misconceptions in her own part of the world. It didn’t hurt that Zimron had a background as a psychologist and self-proclaimed healer. She traveled to the West Bank and to Gaza. Seeing how the people there lived “just so opened my eyes,” she remembers. After Israel and Jordan signed their peace treaty in 1994, an idea came to her: “Salaam shalom aikido.” Salaam and shalom are the Arabic and Hebrew words, respectively, for peace. She would create a program to bring Israelis and Palestinians together to train. The idea, of course, was that the benefits would ripple out from there, back into the participants’ communities. To what degree that’s happened so far is unclear. 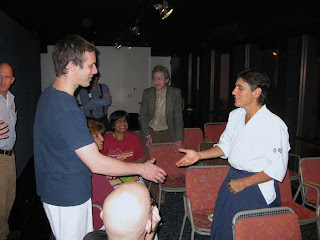 But this is: Aiki Extensions— an organization that brings aikido training and skills to nontraditional venues such as psychotherapy, business, and sports— supports the Mideast Aikido Project, which includes the Salaam Shalom Aikido Initiative. The initiative, now five years old, has a core group of people working just outside of Ramallah, in the West Bank, and has another program at an orphanage in Bethlehem. Zimron— whose work has already brought her to the West Bank, Jordan, Russia, Turkey, Greece, and Cyprus— hopes to start another training program in the city of Tulkaram, in the West Bank. Meanwhile, she’s also helped facilitate the PeaceCamp initiative, another part of the Mideast Aikido Project, which funds trips for Israeli and Palestinian children to America for summer camp. If you happened to stroll by the Oak St. Beach-Michigan Ave. underpass yesterday afternoon, you’d have heard a delightful sound beckoning you to follow it to its source. When you did, you’d come upon two men standing in the middle of the tunnel dressed in thin shirts, jeans, and sneakers. Amidst the cream-colored walls and paint peeling from the ceiling, Trent Santomastago and Ryan Burnett played a flute and alto saxophone to the tune of canonical duets by Georg Philipp Telemann, a German composer in the 17th and 18th centuries. He wasn’t the only one who thought so. Among the tourists and the residents, the runners and the bikers, the couples and the groups and the lone passersby, one or more people would occasionally stop to listen. Most at least turned their heads as they passed. There was the guy on the bicycle who stopped and asked permission to take a photograph of them— and proceeded to shoot several. There was the woman on her cell phone, pushing a boy in a stroller, who stopped before reaching the men, pushed the stroller towards the opposite wall, and proceeded to crouch down to speak to the boy while looking at the musicians. There was the man who stopped to deposit some cash into the music case laid open on the cement ground, only to be followed immediately by another man and then another. There were, too, the couple that found themselves so engrossed in their conversation that they passed within feet of Santomastago and Burnett without seeming to notice them. And the woman for whom an animated cell phone conversation was more interesting than the sound of classical baroque music beneath the median of Lake Shore Dr. This is, after all, a big city. 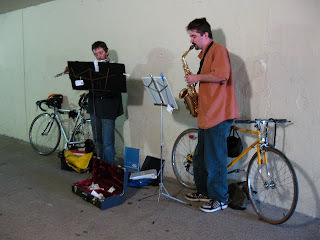 Santomastago and Burnett may have stood out from those around them when they played yesterday afternoon, but in one way, they fit right in: Behind them, propped up against the wall, were their bikes, ready to take the men away when the music ended. David King is a freelance journalist based in Chicago. His work has appeared in the Chicago Tribune, the Chicago Reader, Chicago magazine, and Time Out Chicago, as well as in other newspapers and magazines. He enjoys feature writing and hopes these true stories will lead readers to think, feel, and perhaps consider something in a new way. Stories are posted about twice a month. The banner photo above comes courtesy of J. Crocker and is used under a Creative Commons license. Click here to e-mail the writer.